Home / Surveilstar Features / Website Monitoring / Archive by Category "Social-Networking Sites Monitoring"
Facebook: can’t live with it, can’t live without it. Between spam, privacy issues, and trash in your news feed, Facebook can get pretty annoying, and other networks like Twitter, Google+, and LinkedIn can be just as bad. As long as you’re wasting all your time on social sites, why not fix them up so they work like you want them to? Here are ten ways to do just that. Staying up to date on what your friends are doing is great…until your networks of choice start bombarding you with notifications. “Johnny commented on your status! Stacy tagged you in a photo! Billy bit you and now you’re a vampire!” The best way to deal with this is to edit your notification settings directly, which you can easily do in Facebook, Twitter, and elsewhere. You can also turn your Facebook notifications into a daily digest, prune your phone’s notifications so they don’t bug you, and even make a smarter notification system for more fine-grained customization. Of course, you could just turn them off completely, too—there’s nothing wrong with that. The other kind of spam you get on social networks—besides the notification spam—is the spam caused by malicious links and other fake stories. The easiest way to avoid them? Don’t click on anything that says any variation of “You won’t believe this!” or “Win a free iPad!” or anything vaguely pornographic (and spread the message to your friends while you’re at it). If you’re following (or being followed by) any spam accounts on Twitter, you can also use a tool like Nest Unclutterer to clean them up. Your social networks aren’t the only ones scrambling to grab your data and attention—the third-party apps connected to them are, too. 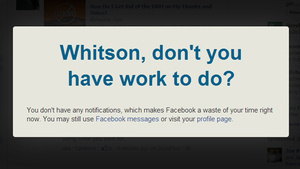 Heck, Facebook even tricks you into ignoring app permissions. 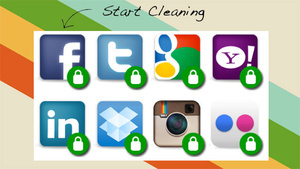 The best way to clean up those app permissions (and delete the apps you don’t need) is to use a service like MyPermissions, which will lead you to the necessary settings for Facebook, Twitter, LinkedIn, Google, Dropbox, Instagram, and more. It’ll even remind you once a month to check your permissions and clean them up, which is pretty awesome in our book. 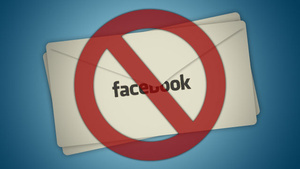 Having a ton of Facebook friends isn’t necessarily a good thing. Not only can it create a lot of clutter, but it’s even a characteristic of unhappy people. 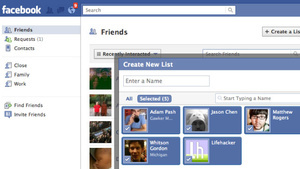 For a cleaner social feed, regularly unfriend and unfollow people to keep things trim. For the really bad offenders (like your horrible ex), go a step further and block them completely. Only follow people that you’re actually friends with or are otherwise useful, and you’ll be much better off—though we won’t blame you if you want to track who unfriends you, too. For those that you don’t want to unfriend, keep them around but divide them into lists. Not only will it keep certain people from seeing all your info, but it makes your feeds smaller and more organized. You can do it on Facebook, Twitter, and on Google+, and even use other services like Facebook’s Smart Lists or Formulists for Twitter to automate the process. If you want a good list to start off with, you can always follow us and our writers on Facebook and Twitter with one click. The default experience on Facebook and Twitter isn’t made for users, it’s made for the companies—so why not use something better for you? Twitter clients are always better than the default site, and we’ve got favorites for Windows, OS X, Android, and the iPhone to try out. You can also make Facebook infinitely better with one simple browser extension, not to mention combine multiple networks with apps like Flipboard. Maybe you try to keep a presence on all networks, or maybe you’ve combined them into a piecemeal social network for yourself. Either way, you probably want to post some of your updates or photos to multiple networks at the same time, and luckily, that’s pretty easy to do—most of the time. Posting from one network to another doesn’t always work perfectly, but it can make your life a lot easier when using Facebook, Twitter, and Google+. And, if you want to include any other networks, IFTTT probably has you covered. Let’s be honest: no matter how much you love them, you probably spend a little too much time on social networking sites like Facebook. You can fix this problem by limiting your visits to time-wasting sites, and using tools like Facebook Nanny to help you get back to work. It’s also worth looking into the worthwhile uses of these networks—for example, use LinkedIn to increase your hirability, or use Twitter for instant customer support and up-to-the minute updates on stuff that matters. Keeping in touch with your friends is awesome…until they decide to start preaching their political beliefs, or start pouring their heart and soul out on their Facebook page. You guys have shared your favorite ways to deal with uncomfortable Facebook discussions before, but it ever gets to be too much, you can go all out and hide those updates altogether. Extensions like Unpolitic.me will replace those political updates with cat pictures, and Social Fixer will let you hide any kind of update you want. Our tips on hiding tech rumors and movie spoilers can also translate to just about anything, too, so you should have your bases covered on every social network. It’s no secret that the biggest social annoyance is actually keeping your data (and your updates) private. Everyone’s trying to track you on the web, and they’re constantly adding new ways to do it. 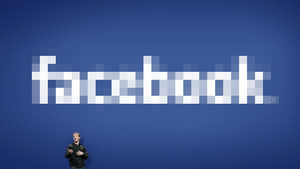 Check out our always up-to-date guide on managing your Facebook privacy to figure out how to stop it, or use a site like AdjustYourPrivacy.com to keep up with your privacy settings on all your networks. Alternatively, you can ditch those privacy-invading sites for something better (or at least tone down your Facebook usage to just personal communication). With the popularity of social media it’s not uncommon to hear stories of strong brands caught in the midst of an online controversy. One brand victim includes Starbucks. Employees at a Miami Starbucks posted inappropriate photos of Starbucks customers online using the social media tool Flickr. Now, Starbucks is well known in the social media space, they have several followers on Twitter, so how did this happen? Another brand victim was Domino’s Pizza. I won’t go into details, because if you didn’t see the video, I don’t want to make you lose your lunch – let’s just say there were two employees of Domino’s Pizza doing very unhygienic things to the pizza they were preparing. It made national news and the video on YouTube received over 1 millions views. The video threatened the reputation of a brand that had been developed by a company for 50 years. Don’t be mistaken, just because you are a business and you are not using social media, don’t think that your brand can’t be hurt by it if you are not paying attention. 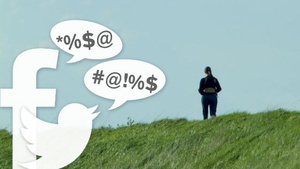 The reality is, whether or not you are participating in social media – you are playing. Your brand in some way or another is being represented,either by you as a company, by your customers or by your employees. Monitoring major social media platforms and solving issues that reflect poorly on your brand is one of the most important parts of any company’s social media effort. As a business, the most important thing to remember is that even if you are not using social media, you need to be aware of what’s going on in the social media realm when it comes to your brand. It doesn’t pay to turn a blind eye and, by doing so, it can, ultimately, be a detriment to your success. We’ve all heard of brand monitoring and many of us, especially small to medium sized businesses, in the past haven’t seen the need. We’d just treat customers well and give them what they need and they’d tell their friends and family. Now that we have the internet and social media, it’s even more important to monitor our reputations, especially as business owners. I always remind the clients with whom I consult that it’s not just seven people one person will tell about your services, now it’s in the millions. This is especially true with the social media tools that are available and widely used, such as Facebook, Twitter and YouTube. I don’t care if you don’t want to use social mediums to market your service or products, it’s more vital than ever to at least have an awareness of what’s being said within the social media realm about you, your brand, your products and your services. Sticking your head in the sand will only hurt you not help you. How Can You Monitor and Protect the Reputation of Your Brand? Step 1: Understand how the social media platforms work. 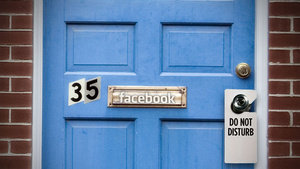 Learn how to use Facebook, Twitter, YouTube and MySpace. Become familiar with their platforms. Take a few moments and read the terms of services and watch and learn how people are using these social media outlets. Step 2. Don’t assume that social media doesn’t affect you. 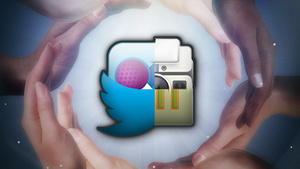 When it comes to social mediums, there are not just thousands of users, there are millions. These users consist of your customers who are bloggers, influencers, columnists and public figures. These people are talking about companies. Are they talking about yours? You need to know this and you need to know whether the chatter is negative or positive. Step 3: Actively Protect Your Brand. There are many steps that you can use to do this. Register your brand names with the various social media platforms, (add comma here) this way you avoid the chance of them being hijacked by someone else. Step 4: Create a social media policy for your company. This means creating a plan that informs and educates employees on the company policy and guidelines of using social media. This policy should inform them as to what they should and should not discuss when it comes to the company. And other appropriate practices and procedures to follow, especially in the event of a crisis. Step 5: Always be aware. There is no excuse not to know what is being said. It’s important to always have your finger on the pulse of what is being said, whether it be positive or negative. You always want to know when someone is talking about your and your brand – ignorance is no excuse. Monitor the social media platforms. Step 6: Embrace the negative when necessary. Social media is a conversation and a dialogue, so be willing to embrace the negative and dialogue in public regarding the situation. This gives you credibility with other consumers. Search Function on Twitter – Search tool that is available on Twitter that shows you what has been tweeted that matches your search query. Google Alerts – Great service by Google that will alert you when search queries you enter have been posted in Google News, Search Engine, Videos, or Groups. Technorati – Technorati will notify your brand has been mentioned in the blogosphere. Monitor This – MonitorThis is a little more technical, but worth it. 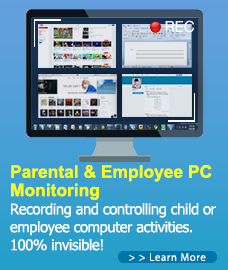 You can have Monitor This watch over – 20 different search engine feeds. Monitor This will make an .opml file that you can put into your RSS Feeder and display any results into that feed. Social media brings many marketing benefits to companies, such as creating awareness and word-of-mouth marketing. It’s not going to go away, so it’s our responsibility as businesses to be aware of what’s going on and, if we don’t have the time or resources to do that, it may be time to consider an outsourced solution, whether it be using that service to market for you or just to monitor what’s being said. Stock photo site Fotolia’s founder, Thibaud Elziere, has just invested a small amount into a new company called mention, a social media monitoring service launching today. Elziere is also a co-founder at mention, which was developed by a European team of five, based in Paris and Brussels. While clearly a crowded space, mention is somewhat different in that it’s targeting individual users and small businesses, as opposed to the enterprise. The business model is a freemium offering, with a certain number of “mentions” free per month, then low rates ranging from $5-$9/month for additional tracking. We’ve covered a number of social media monitoring firms in recent weeks, like Brandwatch, for example, which just raised $6 million to expand to the U.S., and we’ve tracked major moves in the space, like Salesforce’s acquisition of Radian6 last year and Visible Technologies grabbing $6 million in March 2011. We’ve also taken a look at new startups like Meltwater’s launch of Buzz Engage, Disrupt Battlefield company AlphaOutlook, and YC-backed Crowdbooster, just to name a few of the more popular stories. But mention feels different from many of those types of businesses because it seems to be less focused on targeting big brands and more on providing individuals and smaller businesses access to lower-cost tools. Of course, the tools in question are much simpler, too. Mention doesn’t offer analytics-filled dashboards, historical tracking data, details on key influencers, or integrations with in-house systems. Instead, it merely provides a simple app for tracking what’s being said about you, your business, or any other keyword you may want to follow. However, a small team could use the app together, as it does support the ability for one user to “assign” a task to another within the application. “Our technology uses an adaptive filter, so when you delete mentions about Paris Hilton, it will learn, and the next mention about Paris Hilton would be automatically deleted,” he adds. Mention, which was built using newer technologies like backbone.js, node.js, Qt and Webkit, is available now as a web app, a Chrome app, as downloadable software for Windows, Mac and Linux, and will arrive on the iPhone in two weeks, with an iPad app and Android app to follow. It supports three languages (English, French and German), and can track sources across 42 different languages, but no support for translation, unfortunately. It sources content from the usual places – blogs, websites, forums, Google News, Twitter, Facebook, and Google+ (coming this week). Elziere says that the team is now working on beefing up the product’s features, and plans to soon add support for multiple Twitter accounts, enhanced capabilities to reply, like and comment on mentions from within the application (instead of having it open pop-up windows as it does now), support for additional sources (they’re looking into Pinterest), and more.